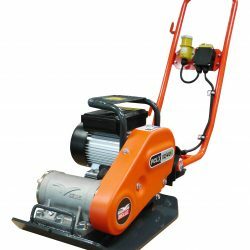 A lightweight professional 12″ compaction plate with low Hand Arm Vibration and high performance compaction with an environmentally friendly electric motor for use indoors and poorly ventilated areas. The ideal Patching Plate Compactor. Designed for the compaction of granular and asphalt materials, Terex Pedestrian Rollers provide class leading performance in the development of highway repair, footpaths, cycle lanes, playgrounds and landscaping environments. For added versatility the Terex MBR-71 roller features a quality tow-behind trailer and hydraulic breaker combination. The hydraulic breaker is ideally suited to asphalt repair work for breaking out damaged materials prior to resurfacing.